A roundup of the varied battlefields we'll be conquering this year. Whether you enjoy turn based games or a good RTS, 2018 will present some interesting options. Naturally, the brace of current 4X games like Civilization 6, Stellaris and Endless Space 2 will continue to receive expansions and updates throughout the year, but there are a bunch of new titles to look forward to besides. Here are the ones we're most excited about, and a few that we can expect to see appearing in 2019 and beyond. Frozen Synapse was a sleek, streamlined tactical squad combat game released in 2011. A tight variety of weapon types and smart asynchronous multiplayer helped it to stand out, now the sequel plans to couch these combat encounters in a procedurally generated city populated by embattled corporations. As in the original game, you give orders to your neon operatives in five second bursts by drawing out pathing and aiming instructions, then you press 'go' and watch your orders play out. The core combat is proven, but we'll have to see how the addition of an overworld relic-hunting metagame builds on those fine foundations. The digitised cut-glass cities already look gorgeous. Total War fans waiting for a return to history could be in for a treat as The Creative Assembly debut the "Saga" series. It's a sizeable Total War game with a much tighter focus on a particular flashpoint in history, namely the aftermath of Alfred the Great's victory against the Vikings at the battle of Edington. Three factions are poised to fight for control of the British isles, but the country is rendered at a much greater scale than we've seen before in a Total War. Take a look at the map at the end of the video below and you can see how the game intends to zoom in and explore the territory in detail. We like everything we've seen so far of this turn based mech combat game. You spend half of your time engaging enemies with a squad of highly customisable mechs, and half managing your mercenary organisation in a tough universe where betrayal is a constant risk. Learn more in our interview at the PC Gaming Show, where we learned more about your home base and the strategic metagame that binds your missions together. 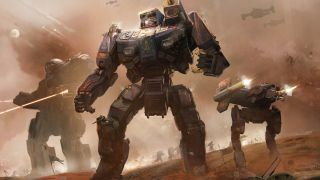 BattleTech/MechWarrior creator Jordan Weisman is onboard, so long-term fans of the BattleTech universe can expect a detailed and authentic take on the universe. It is a good year to be a mech fan. Into the Breach, from the developers of FTL, doesn't have an official release date yet even though from what we've played it could come out tomorrow and be brilliant. It's a turn based tactical combat game set over a tightly limited turn count. In each encounter you have to do is survive an onslaught of giant creatures burrowing up from beneath the planet's surface, but where many strategy games rely on dice rolls and happenstance to generate drama and tactical dilemmas, Into the Breath shows you everything. You know exactly how and where each enemy is going to strike next, and how much damage they will do. Then it's up to you to craft a perfect series of attacks to push enemies around the battlefield and blow them up for sweet XP. The creator of the original X-Com, Julian Gollop, is returning to the genre he helped create with an exciting modern take on the formula. Bodypart targeting, mutating enemies and a grittier look all help separate Phoenix Point from Firaxis' recent XCOM reboots. Soldiers will have willpower and endurance stats to model how stressed they feel when they get shot by alien crabs with miniguns for arms, and there are multiple human factions with their own tech preferences. Of course you can expect to repurpose crab tech for your own purposes, in true X-Com fashion. This could be a dream remaster of one of the best loved PC series ever. The art has been updated to look good at modern resolutions, the population cap has been increased, you can zoom out, pathfinding has been adjusted, you can attack-move, there's an "enhanced orchestral soundtracK" and more. The package will include the original campaign and the scenario editor. The only drawback is the game is releasing "exclusively to Window 10 PCs" according to the Microsoft Store page. Hopefully we'll see it coming to a wider range of PCs later. This will look very familiar to Advance War players, but we're sorely lacking bright turn based tactical games like this. Wargroove's four factions are depicted in vivid pixel art, and include exciting unit types like 'dog' and a very excited archer. Careful positioning and adjacency bonuses are everything in the Advance War formula. An FTL-esque oceanic romp set in a procedurally generated seascape full of pirates and the odd tentacle monster. You order your crew around your vessel during sea battles as they load cannons, fix holes in the hub, and fend off boarding attempts. Meanwhile you have to target your enemy using a range of attacks, from cannons to chain shot that ruins sails. Between battles you navigate between ports to take on missions, earn bounties and upgrade your ship. If the phrase 'Cold War XCOM' piques your interest, keep an eye on this tactical squad game in which you command a team of agents. Your mission, should you choose to accept it, is to sabotage opposing nations, recover intel and flip enemy agents. Stealth is preferable of course, but you can charge in with a machinegun if the circumstances warrant. There is no in-game footage yet, but the first screenshots are full of moody lighting and period outfits. Age of Empires 4: Easily one of the most exciting strategy games on the horizon. A slim concept-art only teaser trailer reveal suggests that it could be some way off, but genre-specialists Relic Entertainment are developing the project, It's a great opportunity to bring back a bastion of PC gaming. Warhammer 40,000: Gladius—Relics of War: In the grim darkness of the future there is war on hexes, where futuristic units take it in turn to annihilate one another for the glory of their respective factions. Warhammer 40K stalwarts the Ultramarines, Orks, Imperial Guard and Necrons duke it out in this follow up to Slitherine's Sanctus Reach and Armageddon. Forged Battalion: Forged Battalion is a colourful RTS from the vets at Petroglyph. You forge your battalion using an extensive unit customisation suite before taking them to the field to battle The Collective. It's due to enter Early Access soon but the final release date is as yet unknown. Phantom Brigade. Another mech game—hooray! This one features turn-based battles in destructible environments and, true to the genre, heavy war machine customisation between missions.